Bufonids are the true toads, although some are not particularly toadlike. The large genus Bufo has over 200 species and is naturally cosmopolitan except for Australia. The other genera are distributed in three tropical areas: South America, Africa, and southeast Asia. Some of these other genera are clearly derived from Bufo, but others belong to a major evolutionary lineage that is distinct from Bufo and its allies. Bufonids range in size from 20 to more than 200 mm. No bufonids have teeth, although the absence of teeth occurs sporadically in other frog groups. Also, many bufonids (but not all) have a Bidder's organ, which is a mass of gonadal tissue in males that has the appearance of an immature testis. If the testis of a male is surgically removed, the Bidder's organ will enlarge and differentiate into a functional ovary. Most toads of the genus Bufo are dull. However, Bufo periglenes is brightly colored and exhibits extreme color dimorphism between males and females. This rare toad lives in the cool wind-swept cloud forests of Costa Rica near Monteverde. It has not been observed in several years and may be extinct. Species of the genus Atelopus, also called Harlequin Frogs, are brightly colored. Atelopus zeteki from Panama have skin toxins (Brown et al. 1977). Bufo spinulosus is among the highest ranging amphibians; it is known from about 5000 m elevation in the Andes of South America. The distribution of living members of the family Bufonidae is indicated in red. 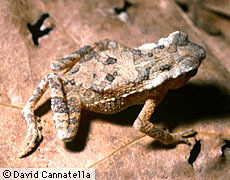 Ford and Cannatella (1993) defined Bufonidae as the node-based name for the most recent common ancestor of living bufonids (Bufo, Frostius, etc., as listed in Frost ), and all its descendants. Putative synapomorphies of Bufonidae are the presence of Bidder's organ (Duellman and Trueb, 1986); a unique pattern of insertion of the hyoglossus muscle; absence of the posterior constrictor muscle (Trewavas, 1933); the absence of teeth; origin of depressor mandibulae muscle solely from the squamosal, and associated angle of orientation of the squamosal (Griffiths, 1954; Starrett, 1968); and the presence of the "otic element," an independent ossification in the temporal region that fuses to the otic ramus of the squamosal (Griffiths, 1954). The distribution of Bidder's organ was summarized by Roessler et al. (1990), and knowledge of the taxonomic distribution is reasonably good. No bufonids are known to have teeth, but teeth are absent in unrelated taxa, including some basal telmatobiine leptodactylids with no clear relationships to other taxa. Barring the close relationship of any of these taxa to Bufonidae, the absence of teeth is tentatively considered a synapomorphy of Bufonidae. The conformation of the hyoglossus muscle and absence of the constrictor posterior muscle were listed by Trewavas (1933) as possible diagnostic features of Bufonidae. 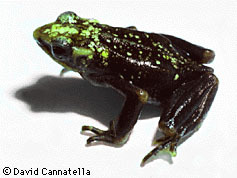 These characters are virtually unique in bufonids among frogs, and Cannatella has confirmed the presence of these in several other bufonid genera, but greater taxonomic coverage is needed. Griffiths (1954) stated that the "otic element" is diagnostic of bufonids, but his observations on its development were limited to seven species of Bufo and two species of Atelopus. Graybeal and Cannatella (1995) discussed the phylogenetic status of all of the bufonid genera. Duellman, W. E., and L. Trueb. 1986. Biology of Amphibians. McGraw-Hill Book Co., New York. Frost, D. R. (Ed.) 1985. Amphibian Species of the World. Allen Press and the Association of Systematics Collections, Lawrence, Kansas. Graybeal, A., and D. C. Cannatella. 1995. A new taxon of Bufonidae from Peru, with descriptions of two new species and a review of the phylogenetic status of supraspecific bufonid taxa. Herpetologica 51(2):105-131. Griffiths, I. 1954. On the "otic element" in Amphibia Salientia. Proc. Zool. Soc. London 124:35-50. Roessler, M. K. P., H. M. Smith, and D. Chiszar. 1990. Bidder's organ: a bufonid by-product of the evolutionary loss of hyperfecundity. Amphibia-Reptilia 11:225-235. Starrett, P. H. 1968. The phylogenetic significance of the jaw musculature in anuran amphibians. PhD. Dissertation. University of Michigan, Ann Arbor, Michigan. Trewavas, E. 1933. The hyoid and larynx of the Anura. Trans. Royal Phil. Soc. London 222:401-527. Page: Tree of Life Bufonidae. True Toads. Authored by David Cannatella and Anna Graybeal. The TEXT of this page is licensed under the Creative Commons Attribution License - Version 3.0. Note that images and other media featured on this page are each governed by their own license, and they may or may not be available for reuse. Click on an image or a media link to access the media data window, which provides the relevant licensing information. For the general terms and conditions of ToL material reuse and redistribution, please see the Tree of Life Copyright Policies.